iOS has long supported many ways for you to share the content you're browsing, and iOS 9 is going to add a new one. 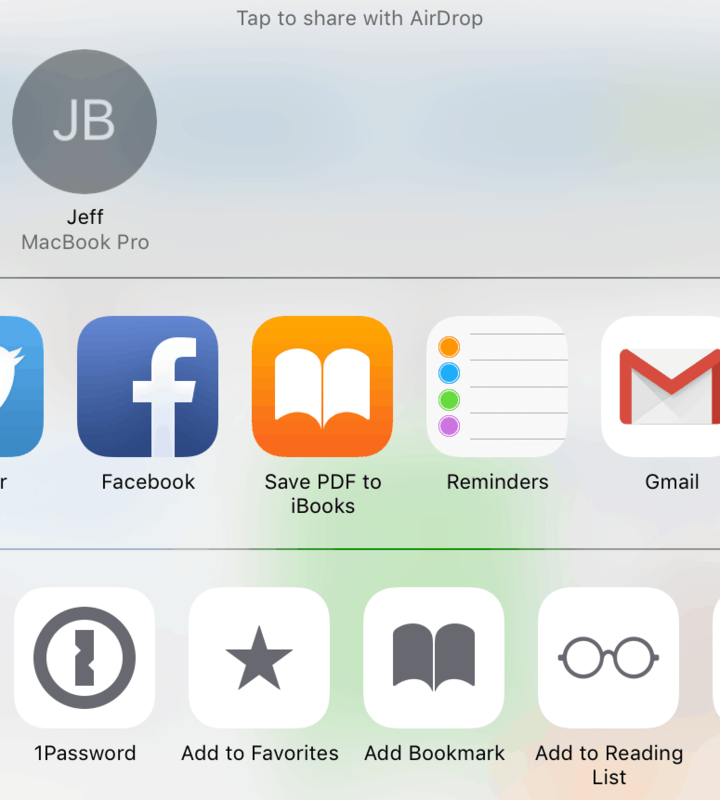 iDownload blog has noticed that the latest beta release of iOS 9 includes an option to save a webpage in Safari as a PDF and transfer it to iBooks. iBooks (and not other ebook apps) was the only option offered, but on the plus side this sharing option has also been sighted in other Apple apps, including Photos and Notes. That means that this new option is going to allow users to easily turn a webpage or other document into a very adequate PDF in seconds. Getting that PDF out of iBooks is going to be a little more difficult, but iBooks will let you email the PDF so you can always simply send it to your inbox and work from there. iOS 8.4 is expected to drop this week and bring iBooks textbook support to the iPhone, but iOS 9 won't be coming until this fall (if not later). Along with the new sharing option, iOS 9 will also have the Apple News app. That app is going to give readers a new way to find the latest stories, and it's also going to offer web publishers a new source of revenue. Another iOS 9 I'm looking forward to is the new split-screen and multi-window modes Apple showed off a few weeks back. The split-screen feature is going to let iPad Air 2 owners run two apps at once, but the rest of us iPad owners will be limited to only enjoying the slide-over feature and watching videos in their own pop out window. Regarding file storage in IOS, Apple has backed itself into a corner. Yes. Storage on iOS is still based on the assumption that it is on a phone (not a smartphone or tablet). It’s not structured so apps can use it in a reasonable manner, and that limits what you can do with an iOS device. This is one of the things Apple should have fixed before they released the iPad. The problem now for Apple is that there are many nice apps that they would make obsolete by addressing this within IOS. What do you mean by obsolete? I can see how that would break apps, but how it would make them obsolete. And I’m fine with breaking apps; Apple could have fixed the storage issue with any of the new versions of iOS. Those usually break apps anyway. Goodreader for example provides for a file system and reading of many different file types. Why do some websites only save 1 page- instead of all pages- as PDF to iBooks? Because Apple didn’t test this feature adequately before shipping it? Other than this is an obvious software bug, I really don’t know why it’s happening.